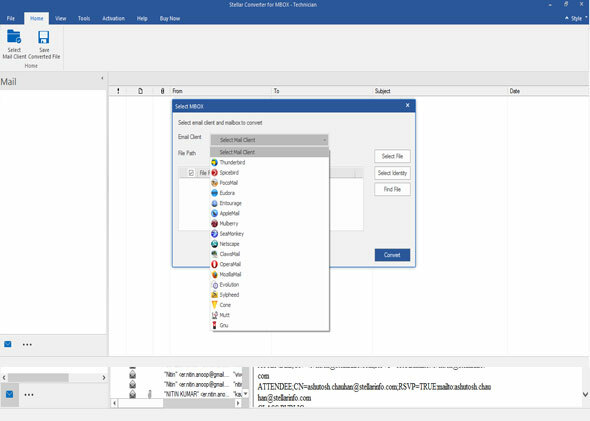 A comprehensive software that can easily migrate 17 different types of MBOX Clients to Microsoft Outlook. These email clients include Thunderbird, Entourage, Spicebird, Pocomail, AppleMail, Eudora, Mulberry, SeaMonkey, Netscape, ClawsMail, OperaMail, Mozilla Mail, Evolution, Sylpheed, Cone, Mutt, and Gnu Mail. The software converts all items including emails, calendars, contacts, journals, notes, etc. and saves them in PST or another preferred format. The converted items can be appended to an existing PST file or a blank PST to import in Outlook. Also, the Admins can export the converted files directly to Office 365 with the help of valid login credentials. An option to save the selected emails in other formats like EML, MSG, PDF, RTF or HTML is also available. For convenience, the converter software for MBOX provides a detailed preview of all mailbox items. With this feature, the admins can verify the converted data before saving it. Stellar Converter for MBOX allows conversion of single or multiple MBOX files through a single process, thus facilitating easy and quick migration. If required, Admins can use the 'Apply Filter' feature to select and save emails as per 'Date Range'. The software also provides an option to exclude data from particular email addresses before saving it. This 'Apply Filter' feature is useful as the PST file is made free from excessive data and its size is reduced, so the chances of PST file corruption are minimal. The software with its new enhanced GUI is easy to use, which saves the Admins from tedious and risky mailbox conversion methods. Further, the software provides Log Report to help with future references on MBOX conversion tasks.